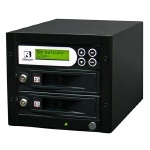 Hard Drive Duplication and Erasing equipment. 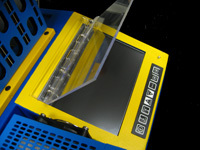 Did you know that CD Solutions offers custom hard drive destruction? If you have a hard drive that you not longer want or need you can send it to us. You have two options and you'll need to tell us which you are ordering when you send us your drive. Option #1, we can erase your hard drive using the WipeMasster solution from ICS then donate your cleaned drive to a non-profit organization for reuse. Or if you prefer, you can use Option #2 where we will physically destroy your hard drive using our 20 ton press insuring that your drive is totally destroyed. Any confidential information you may have had on the drive is gone as the drive is smashed to bits. Call your sales representative to place your order. Cost is just $15.00 per drive. FGR-0024-000A ImageMasster Adapter for TravelStar Hitachi ZIF CHA-6019-900A The Rapid Image 2.5" add-on Option for the Rapid Image Master Caddy is an easy to install hardware that allows the user to expand the Rapid Image Master Caddy capabilities to support 2.5" Hard Drives. 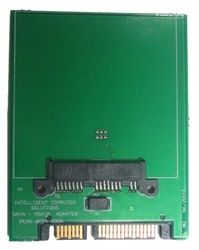 FGR-0033-100A The Micro S-ATA 3.3V adapter can be used to convert the standard 5V S-ATA 22 pin interface to the 3.3V Micro S-ATA 16 pin interface used by Micro S-ATA drives. There are different adapters for different units. This one is designed to work with the ImageMASSter 4000i, ImageMASSter Solo 101, RoadMASSter -3, WipeMASSter and ImageMASSter 6007SAS units. Please be sure you are selecting the correct adapter for your unit as adapters are non returnable. FG-3550-000A 9 POWER & 9 IDE DATA CABLE SET 4008i (6") FGR-0024-900A IM Adapter Drive Guide "ZIF" PCAR-6027-000A This adapter is designed to slip conveniently into the 4000PRO, WipePRO and Rapid Image 2.5" Unit Caddies. The use of this adapter along with the 2.5" Caddy allows the copying of Compact Flash (CF) cards utilizing the ICS Image MASSter 4000PRO, Rapid Image Duplicators and the WipePRO sanitization Station Unit. FG-0216-001C IM Micro Drive Support/CF Adapter F-CABLE-MCRSATA This accessory requires a ZCLONEXI, microSATA to SATA adapter. Clone microSATA type hard drives. DM-HS0-3H2BS The new HD Mini is a portable Hard Disk Drive Duplicator with the combination of light weight, slim and compact design. Easy to carry around, HD Mini simply allows you to work more flexible! FGR-0025-000A Drive Cooler Solution for IM4008/4004 and WipeMASSter range. 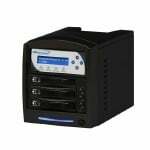 HDDMINIDUP-2 The Vinpower Digital standalone HDDMINI 2-target hard drive duplicator is the perfect solution for those that need to make back-up or residual clones of their master hard drive (HDD) content. The sleek compact light portable construction of the HDDMINI allows the user to take it anywhere and make quick and reliable clones of nearly any HDD using virtually any OS platforms, such as Unix, Linux, Windows, or Macintosh. 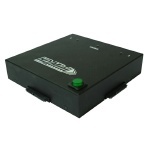 HDDShark-2T-BK The Vinpower Digital standalone HDDShark hard drive duplicator is the perfect solution for those that need to make back-up or residual clones of the master hard drive (HDD) content. Available in multiple size configurations supporting reading and writing speeds up to a blazing fast speed of 75MB/sec, allows the user to make quick and reliable clones of nearly any HDD using virtually any OS platforms, such as Unix, Linux, Windows, or Macintosh . The HDDShark supports the FAT16/32, extFAT, NTFS, and ext2/3/4 file systems. Using the HDDShark gives you a piece of mind that each HDD will be copied accurately and quickly for a no hassle, low cost alternative to performing this task 1 at a time through a PC. FGR-0021-999A Linux-IQ Copy Software for Rapid Image FGR-0009-100B IM 4008I Serial ATA 9 Channel Adapter (SATA-9). This adapter let you connect SATA drives to your IM 4008i. It requires CBLR-0402-000A cables. 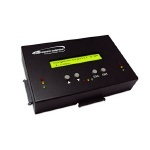 HDDSharkTB-2T-BK The Vinpower Digital standalone HDDShark Turbo hard drive duplicator is the perfect solution for those that need to make back-up or residual clones of the master hard drive (HDD) content. Available in multiple size configurations supporting reading and writing speeds up to a blazing fast speed of 150MB/sec, allows the user to make quick and reliable clones of nearly any HDD using virtually any OS platforms, such as Unix, Linux, Windows, or Macintosh . The HDDShark Turbo supports the FAT16/32, extFAT, NTFS, and ext2/3/4 file systems. Using the HDDShark Turbo gives you a piece of mind that each HDD will be copied accurately and quickly for a no hassle, low cost alternative to performing this task 1 at a time through a PC.